The Mosquito 1200 Retractable Banner stand offers a 47.25"w Banner graphic to make a big visual impact. 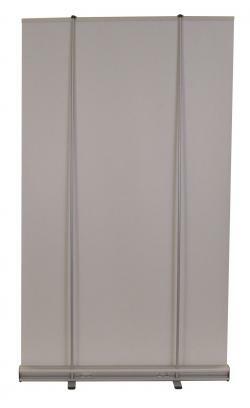 Both easy to assemble and simple to use, the Mosquito 1200 47.25" wide banner stand is finished in anodized silver and features 2 3-part bungee corded tension poles. Two swivel out feet add stability to this banner stand when erected. A padded carry bag is also included for convenient transport and effortless storage. 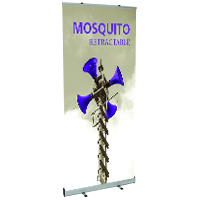 All Mosquito Retractable Banner Stands are an eco-friendly product choice! 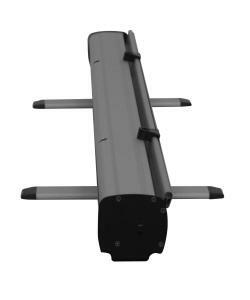 Banner Stand Lighting is also available, sold separately! 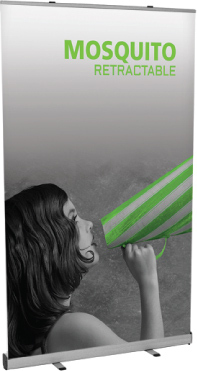 Mosquito Banner Stands come with a 90 Day Warranty against manufacturer's defects, printed graphics are not warranted. 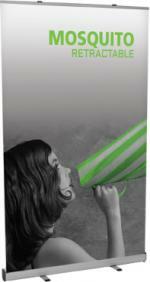 Shipping Weight: 12 pounds; Shipping size: 50" x 5" x 5"
The Mosquito 800 Retractable Banner stand is the perfect Banner Stand Solution for an excellent value. The Mosquito Lite Retractable Banner stand is the perfect Banner Stand Solution for an excellent value.